5 INCHES!!! of Memory foam!!! Please note that memory foam mattresses should have a minimum of 3 inches of memory foam. The starter range and the bronze range have less than the required amount of memory foam. 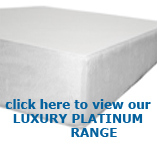 We offer these ranges as a cheap alterative to memory foam. The Starter range and the Bronze are not covered by our 5 year guarantee the starter range and the bronze range only come with a 12 month guarantee for more information please see our terms and conditions. Latex Memory foam Mattress (4 inches of memory foam) 1 inch OF Super luxury Latex top layer + 3 inches of 80 kg/m3 middle layer Total memory foam depth 4 INCHES!!! Latex Memory Foam improves mattress durability and support. It has an unique Layer support structure, which ensures the top layer conforms with your body shape and allows for free air circulation through the mattress, to keep you cooler in summer and warmer during winter nights. 100% Full Latex Memory Foam Mattresses. Only sold by The Memory Foam Mattress Firm!! !